What do you do if there is a Zombie attack? Can mathematics help? This post is (humorously) dedicated to collecting links to papers or blog posted related to the mathematical models of Zombies. 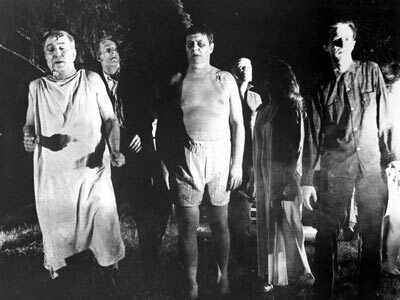 George Romero‘s 1968 Night of the Living Dead, now in the public domain, introduced reanimated ghouls, otherwise known as zombies, which craved live human flesh. Romero’s script was insired on Richard Matheson’s I Am Legend. In Romero’s version, the zombies could be killed by destroying the zombie’s brain. A dead human could, in some cases be “reanimated,” turning into a zombie. These conditions are modeled mathematically in several papers, given below. When Zombies Attack! Mathematical Modelling of a Zombie Outbreak!, paper by Mathematicians at the University of Ottawa, Philip Munz, Ioan Hudea, Joe Imad and Robert J. Smith? (yes, his last name is spelled “Smith?”). More Zombie publications by Univ. Ottawa Math Dept Prof. Robert Smith?. Epidemics in the presence of social attraction and repulsion, Oct 2010 Zombie paper by Evelyn Sander and Chad M. Topaz. Statistical Inference in a Zombie Outbreak Model, slides for a talk given by Des Higman, May 2010. Mathematics kills zombies dead!, 08/17/2009 blog post by “Zombie Research Society Staff”. The Mathematics of Zombies, August 18, 2009 blog post by Mike Elliot. Love, War and Zombies – Systems of Differential Equations using Sage, April 2011 slides by David Joyner. This was given on April 22, 2011, as a Project Mosaic/M-cast broadcast. Public domain 1968 film Night of the Living Dead by George Romero. This entry was posted in cimema, math, sage, teaching mathematics and tagged mathematics, movie, open source, sage, zombies. Bookmark the permalink.